Michelle Rose moved to New York City to pursue her Masters’, and discovered Yoga while working in the arts. Michelle was exposed to the physical practice of Yoga through her dance training; however, she did not truly realize the mental benefits until she cultivated a daily practice. While trying to balance a hectic work schedule, Michelle began to use Yoga as a means to strengthen her mind and body. 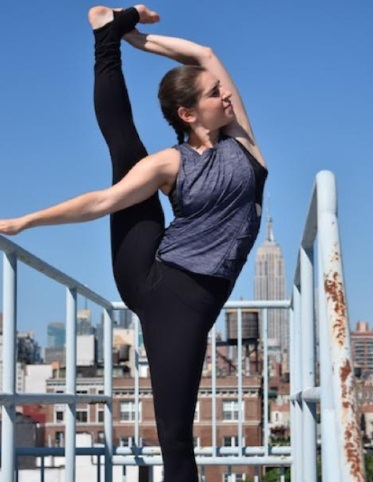 In 2015, Michelle started a daily Ashtanga practice, and continues to learn from Eddie Stern at Brooklyn Yoga Club. As a student, Michelle never wants to stop learning. As a teacher, her goal is to create a supportive, structured environment that allows students to explore and discover their individual strength and potential. Michelle completed her 200-hour YTT as well as a 50-hour mentorship program from Yoga Vida in NYC, where she teaches group Vinyasa classes. She holds a B.A. from Mount Holyoke College and an M.A. from NYU Gallatin. And as a fun anecdote: when she was eight years old, Michelle was in a K-Mart commercial with Martha Stewart. -Teaching myself new skills. I like taking on personal challenges and figuring them out. I also think I can explain things really well. -Making people laugh and being my natural quirky self. I like to think I’m quick-witted – thinking on my feet and shifting focus at a moment’s notice. I always try to make people feel special, appreciated, and supported. If I care about someone, I will do absolutely everything in my power to make sure they know that. I want to help people feel good about themselves. I want to inspire others to cultivate strength and happiness that they never knew they had. People will not always remember you for what you did, but for how you made them feel (paraphrased Maya Angelou). In my own experience, this has proven so true. To be honest, I am still figuring out exactly how to do this, but I think I’m heading in the right direction. When I began making decisions for myself and not for others. I am such a people-pleaser I’ll do almost anything for anyone! Even at the expense of my own sanity, wellbeing and happiness. I’ve also gotten better at pretending to be extroverted. Even small social situations can be really challenging and emotionally draining for me. Especially when I’m around people I don’t know very well, my natural instinct is to run in the opposite direction and avoid eye contact. Over time I’ve become a lot more comfortable, and less vulnerable, around new people. Every single day is saturated with so many challenges. So for me, it has been less about a specific moment as much as personal obstacles that continually present themselves in different situations. For example: I have an extremely hard time letting go – of people, of things, of ideas, etc. I am quick to get emotionally attached, even if the things aren’t necessarily “good” for me. So one of my biggest continuous challenges is knowing when and how to let go. I am also terrified of change and new beginnings. I’ve come to realize, though, that once I start, my fear dissipates. Unfortunately, that realization doesn’t prevent the fear from arising in the first place! An amazing teacher, Jeffrey Villanueva, once advised me that “everything happens when it is supposed to – so be ready for it.” Basically: don’t be impatient, and then don’t shy away from new challenges and opportunities when they do arise. This advice has helped me a lot. “Go with the flow” – I love this because it is not at all something that I do naturally. I live my life in a very structured, organized way. And if something disrupts my patterns, I get rattled and lose focus. “Every day is a new chance to start over” - This is a lesson that I learned through my Yoga practice and something I try to carry with me off the mat. If something is challenging or upsetting today, don’t worry about it too much. Try your best, and know that tomorrow is a new day. We can never erase the past, but every morning we have the opportunity to start over at “one.” So start the day with your head up, take a deep breath, and do your very best working on one thing at a time. “You’re not perfect, but you’re not your mistakes” – this one is from a Kanye song. Don’t let yourself be defined by your failures. Personally: I have three “best” friends, and none of them live in NYC - but when we see each other, it’s like no time has past. My two brothers – we’re all really different, so being around each other is always entertaining. Charlie Chaplin - There’s something about his quirkiness, specificity, and authenticity that has always resonated with me. I wouldn’t be surprised if he and I were related in another life. Professionally: I have endless amounts of respect and appreciation for Monica Bill Barnes – a NYC based choreographer and one of the loveliest, most intelligent people I have ever met. She was the first person who allowed me to believe that I could (and should!) make a living doing what I loved. Working with her challenged me to make a bridge between what I loved and how I lived. Personally, she is unconditionally gracious and warm. Professionally, she is ingenious and unstoppable. And then directly after I finished my 200-hour Yoga Teacher Training, I did a mentorship program with Lindsay Hilscher. I learned a lot from her personally and professionally – she is a sea of knowledge and a true role model. I am a firm believer that in order to be a great teacher you need to be dedicated to your personal practice. Lindsay is living proof of this. Sitting in front of a campfire or fireplace. I love going to my parents’ house. I grew up only an hour outside of NYC, but it feels so isolated. The area is surrounded by woods and trees, and there is terrible cell service – it’s great! At night you can hear the crickets, and bullfrogs, and can see all of the stars. I sleep so much better there than anywhere else. I’m obsessed with apple orchards. My absolute favorite fall activity is apple picking. I’ve been doing it since I was a little kid and it NEVER gets old. I’d rather sit in an apple orchard than on a beach any day. My yoga mat. No matter where in the world I am, when I step on a mat it feels like home. Scarfs. Cozy sweaters. Fuzzy Socks. I have a ring that I always wear on my right hand – I only take it off when I sleep, shower, and practice Yoga. I also wear a wristwatch – I get nervous if I don’t know what time it is! Tea that I don’t have space to store. And good coffee. Earlier this year, I bought a Harmonium and I’ve slowly been learning how to play it. It’s just the most magical instrument. The first time I heard one played, I completely fell in love. The sound bypassed my ears and went strait to my heart – it made me feel safe. Also dogs. All of the dogs. I will stop in the middle of a New York City sidewalk, SIT DOWN, and pet a dog. I always love discovering and listening to new music. About two years ago, I started practicing Ashtanga Yoga. I needed something that was going to challenge me mentally and physically as well as hold me accountable for my own breath and movement. By doing the same postures day after day, I began to notice reoccurring patterns in my mind and body. I remember one day I was having difficulty getting into a posture – I looked up and said to the teacher “I just get terrified.” I was shocked that I admitted the fear out loud, especially because I did not know what I was specifically terrified of. That was an eye-opening moment because it revealed insecurities that I didn’t know I had. It also challenged me to dig up mental blocks that were holding me back off the mat. In addition to the numerous physical benefits of the practice, it has created stability in my life. It is a practice I can take anywhere. ARTS. AND. CRAFTS. I always need to have some kind of ongoing project.